The second round of the Chiltern Cross Country League was held at Tear Drop Lakes, Milton Keynes on Saturday. It was combined with the UK Cross Challenge (National Cross Country League) and in the senior age groups the RAF v Oxford University match. 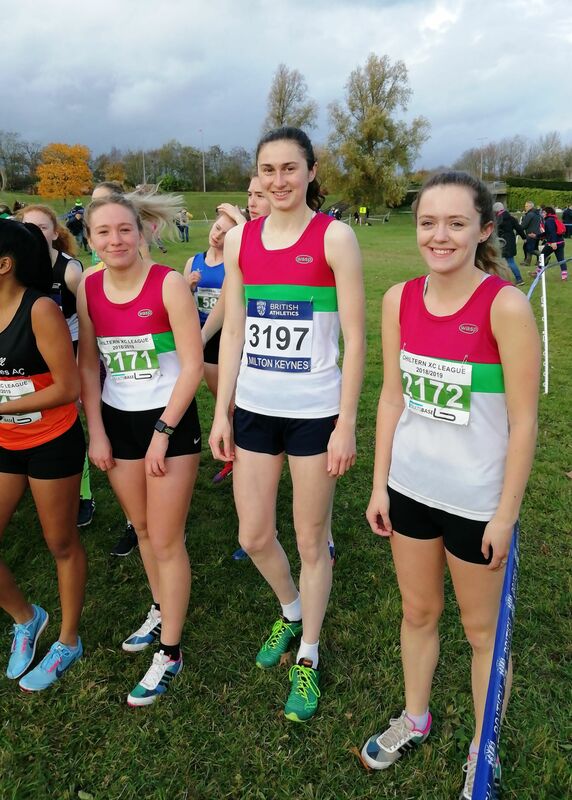 This led to some very big fields, and gave the Banbury Harrier athletes a chance to compete against the best cross country runners in the country. The course was wet from the overnight rain, and contained 2 short but steep hills on each lap. The U11 Girls were the first race of the day, and a very well paced run with a good sprint finish saw Isla McGowan secure an impressive 2nd place to go one better than her third place in the first race. Charlotte Hall had a strong run to come in 11th. In the U13 Girls race Tilly Lainchbury came in 20th of the 91 runners despite suffering a stitch during the race. The U13 Boys race saw Sam Davis finish in 47th place with another year in this age group. In the combined U17/U20 Ladies race Emily Thompson showed her winter training is paying dividends already with a very impressive run. This is a very competitive age group, and showing great confidence Emily went out with the lead runners, a number of whom have GB vests for cross country. She sat in a good position during the middle part of the race, using her improved endurance ability to great effect and finished strongly to secure 8th overall and 6th U20 athlete from the 110 starters. Tia Williams had a solid run in 57th place, with Katie Pamphlett in 86th, which gave them 3rd division 2 team on the day. Another strong age group is the U17/U20 men, and this was won by Matt Willis, one of the best young triathletes in the country. Skip Snelson ran a solid race to come home 48th overall and 25th U17 of the 13 runners. The rain held off until the start of the Senior Womens race, but a light shower on the start line turned into a heavy downpour during the race. Kate Avery from Shildon Running and AC was first lady home, followed by Jess Judd, who competed for GB at the last Olympics, in 3rd place. Michelle Bartlett was first Banbury Harrier home in 87th place and 3rd F45, Ros Kelling in 124th and second F55, Rebecca Biegel 264th and Hester Pollock 289th of the 364 runners. This gave them 6th Division 2 team on the day. Mahamed Mahamed from Southampton AC, one of the best young track and cross country runners in the UK, was the winner of the Senior Mans race. Of the Banbury Harriers runners Logan Kelling was home first in 327th, Phil Coy 446th, Glyn Pritchard 505 (3rd M70), Neil Forbes 506 and Andy Bartlett 527 in a large field of 543 runners. Thanks to Roz for the report, Richard Thompson for the group photo of Katie Pamphlett, Emily Thompson & Tia Williams and Emma McGowan for Isla's shot.